Specialists in endoscope reprocessing for more than 30 years! 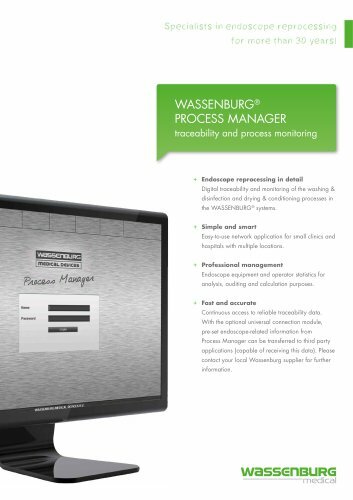 WASSENBURG® PROCESS MANAGER traceability and process monitoring + Endoscope reprocessing in detail Digital traceability and monitoring of the washing & disinfection and drying & conditioning processes in the WASSENBURG® systems. + Simple and smart Easy-to-use network application for small clinics and hospitals with multiple locations. + Professional management Endoscope equipment and operator statistics for analysis, auditing and calculation purposes. + Fast and accurate Continuous access to reliable traceability data. With the optional universal connection module, pre-set endoscope-related information from Process Manager can be transferred to third party applications (capable of receiving this data). Please contact your local Wassenburg supplier for further information.